Is there a moment, when you look at your social media timeline and see pretty pictures of your friends on vacation, then you thought, wow, they look like they're having the time of their lives! And then you think, if I were going to vacation like that, with my child, there is no way it's going to turn out to be THAT fun, it's just gonna be a catastrophe! 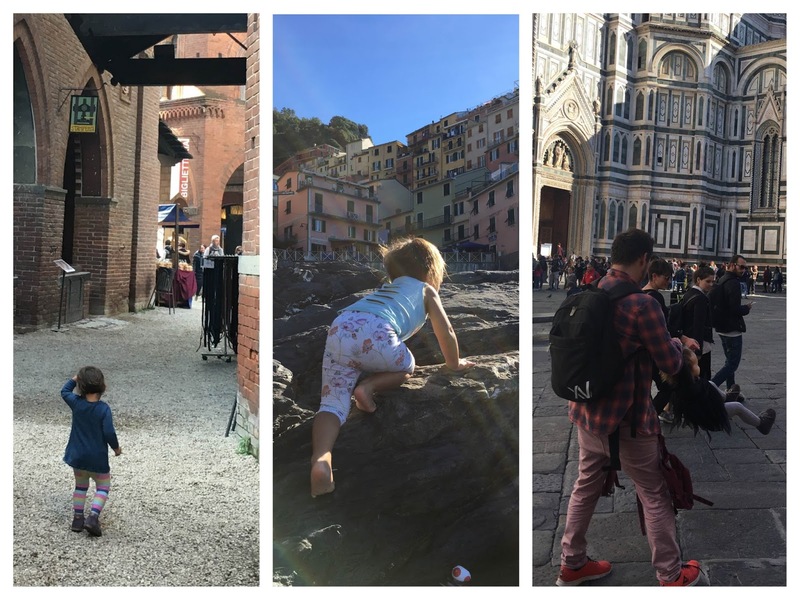 For some reason of course I also just post pretty pictures to my social media, I'm not planning to shame my own child and post a picture of her having a tantrum, soaking wet full of tear, lying down in the middle of a square in Florence. But trust me, it happens. I wanted to share some not-to-pleasant moments happened in our last Italian road trip just to assure you, traveling parents, that it's okay to experience unpleasant incidents during your trips. Believe me it passes quickly and you'll forget them even quicker. But the sweet memories of the trips? Oh they stay forever. So last week we did our Italian trip to replace our cancelled cruise (more about that here). We left home on Wednesday night after work and headed to Turin. Our initial route was Lake Garda-Turin-La Spezia-Cinque Terre-Pisa-Florence, but in the last minutes we decided to just skip Garda and drove directly to Turin. So what's was not all roses during our six-days trip? These are the things she'll remember. All the fun she had! Unfortunately our new car isn't equipped with a built in navigation system. That means, we're still using our GPS we bought six years ago and never updated. When I created the route in my head, I knew we needed to leave Ljubljana and head for the border with Italy in Gorizia, drive through Venice, Verona and Milan then arriving to Turin. We started to drive from Ljubljana around midnight and hoping to arrive in Turin at around 6am. My husband was driving, I put the GPS on for Turin and we realized something was wrong when we passed the border between Slovenia and Austria instead of Slovenia and Italy. Yup, our GPS led us to drive through Villach in Austria just to get back down to south to Italy after having to buy Austrian vignette (€18 with a tunnel). We had to drive 150km more than planned and paid an extra €25 of Italian toll for that. Instead of 6am, we got to Turin at 8am, of course, super exhausted, even with 3 cans of redbull. Of course, we stopped using this GPS and navigated with my iPhone the following days. Right, we were in the train from Manarola (one of the five villages of Cinque Terre) heading to La Spezia, our "base" city where our hotel was located. I've got us two one-way train tickets which cost €4 each (it's only 10-minute ride). Babygirl had a free ride as kids up to 4-year-old didn't need to buy tickets. I read the warnings on the ticket that we had to validate the tickets before departure. But as we were rushing into the train which was about to leave, we didn't even find where to validate them. Five minutes into our ride, an officer came to check our tickets. I handed them and he said no, these are not validated. He said a lot of things but all I heard was a €50 fine for each. My husband was trying to apologize (and argue) with him for a good five minutes while I was trying to comfort babygirl who started to become so fussy. The guy threatened us to call the police if we wouldn't pay the fine, when we arrived to our station La Spezia, and we all went out. The guy asked us to follow him, so we thought it was over, we needed to pay the fine; when another customer was approaching him in panic outside the wagon to ask whether the train that was about to leave was hers. Before attending to her, the guy just shook his palms to us and said: just go, you're free to go. We turned our back and walked away the station in the speed of light. And while doing this, we saw a validating machine and my husband validated our tickets while we're leaving the station. Yup, my husband and his sense of humor. We realized we're actually getting old, on a trip! I'm only 28, and my husband's 33. I'm 7.5-month pregnant so he believes that is an important factor. But boy, we're no longer what we were 5 years ago! A few years ago we'd leave our office on a Friday afternoon and head somewhere, drive the whole night and arrive in our destination on Saturday morning and we'd be completely happy and fresh. Now? Yeah right! We were literally broken when we got to Turin at 8am after driving for almost 8 hours. He was doing most of the driving because I was falling asleep -I handled only around 150 km probably. We had a short nice talk with our friend who was hosting us in Turin before she left for her class, and we just slept until midday while babygirl was playing by herself with our friends' dog. Mind you, she was sleeping the whole night in her car seat while driving. Three days later in La Spezia, after taking a walk around the port and marina then had dinner, we were back at the hotel at around 8pm, completely tired. My husband mumbled, "if we didn't have her (referring to babygirl) we'd now totally go out and dance the whole night." I responded with, "really?" to what he said "nah, probably not. I'd go now straight to bed!". Of course, we had a nice hot bath with babygirl and went to bed. I made a brief plan before we left. Things we wanted to visit. It was nothing too ambitious, just to make us plan our days easier. But as I might have mentioned a couple of times in my previous posts, with babygirl we're trying our best to travel while catering to her needs and responding to her mood. Our fifth day on the road, which was first day in Florence, she already showed some extra crankiness. She was mostly fine, it was just a combo of fatigue and, I guess, a disappointment because she had to say goodbye to a lovely dog of our friends with whom we stayed in Turin. We had to go further to La Spezia from Turin and the little dog had to fly to Greece with our friends, and babygirl didn't love that. We managed to visit the Duomo, Palazzo Vecchio and Basilica Santa Croce with her, and visited Ufizzi Gallery then strolled along Arno river and crossed Ponte Vecchio while she was napping in the carrier, but she was just nearly impossible to handle at the end of the day. That night instead of having supper at a nice restaurant as we did in the previous days, we decided to have a calm night and ordered pizza to to hotel room. The next day, which was our last day in Florence, she wasn't really in a better mood. After breakfast we decided to "give up" the day -which was meant to visit Palazzo Pitti and Boboli gardens, and just stayed in the hotel. Somewhere during the day she stated she wanted to take a walk, so we just walked along the river next to our hotel, saw some ducks and strolled back to the hotel before checking out and leave. Don't worry, it's only 2% hard. 98% is fun! A few years ago, these little things would totally make me upset. Especially things like, I didn't get to visit this Boboli gardens when I was already in Florence?! Who knows when, if ever, would I come back to Florence? Or the thing with the fine in the train, a few years back it would've probably created an argument between my husband and I, like, whose fault that was, why he or I was so careless about it. Now? Nah, we don't have time for arguments and nervous breakdowns. What happens, happens. We stick to that Dalai Lama's "If there's no solution to the problem, don't waste time worrying about it. If there's a solution to the problem, then don't waste time worrying about it". After all, we were 98% having fun during the trip! And believe me, you would, too!